I think liquorice is a scandinavian thing. Well Germans like it too. Salty, sweet and spicy liquorice is candy in Denmark. A couple years ago liquorice started showing up in chocolate, desserts and food in general. My childhood friend would claim that we teased her when she ate liquorice and chocolate together, but I don't remember that. Laste year I made some chewy from but soft caramels made from condensed milk from Anne au Chocolat' website. Having a craving for liquorice I tried to make them again but this time adding liquorice and other small changes. For me this combination was close to perfection. 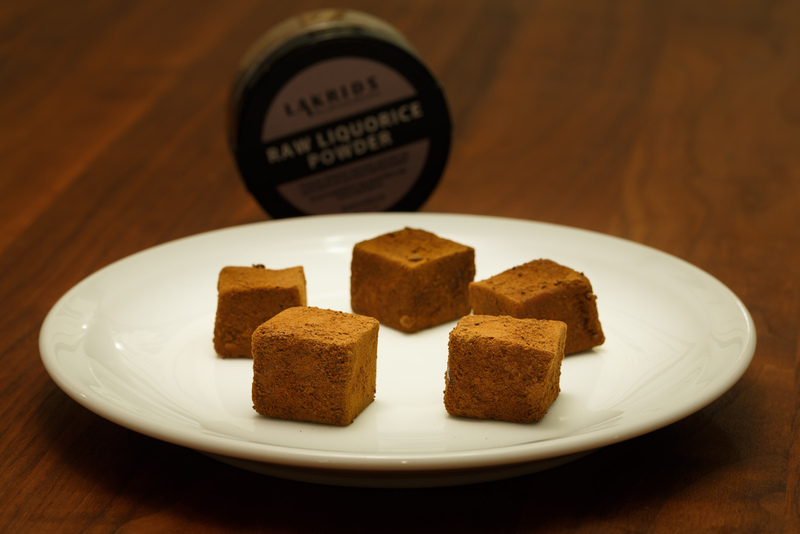 I used Bülow Raw Liquorice Powder, Fine Liquorice Powder and Sweet Liquorice Syrup. Bülow has been one of the most innovative producers of liquorice in years. I think it's thanks to Johan Bülow that we have all these new liquorice products. Melt butter, sugar syrup and condensed milk over medium heat. Keep stirring until everything is melted. Turn up the heat and simmer the caramel for about 10 minutes till it reaches 257℉ (125℃). Remove from heat and mix in the liquorice powder. Pour the caramel into a loaf pan lined with parchment paper, and let the cool in the refrigerator for 4-5 hours. Cut the caramels into cubes, and roll them in the fine liquorice powder, and wrap them in candy wrappers. Next time, I think I will freeze the caramels and cover them with chocolate, because the caramels bled, and got very sticky.